What Can I Do With A Graduate Degree? Submit your graduate advisor approved Application for Graduate Degree to the Graduate School. PHD students must also complete and submit the SED survey. You will receive email notification from the Graduate School once your application is approved. The diploma fee and the UMI online publication fee are billed to your UTEP Goldmine account upon approval of the Application for Graduate Degree. Do not submit payment with the application and do not pay the diploma fee until your Application for Graduate Degree has been approved by the Graduate School. PLEASE NOTE THAT IF YOU DO NOT GRADUATE YOU WILL BE REQUIRED TO RESUBMIT A GRADUATION APPLICATION. Graduation applications accepted for spring conferral. Last Day for On-time Application –$35.00 Fee. Late graduation applications accepted for spring conferral. $15 late fee assessed. Last day to submit your graduation application if you want your name included in the spring commencement program. Only the names of master's degree candidates who have submitted their graduation applications through this date will appear in the commencement program. Names of summer candidates will appear in the fall commencement program. Deadline to submit the Committee and Graduate School approved dissertation and signature page. 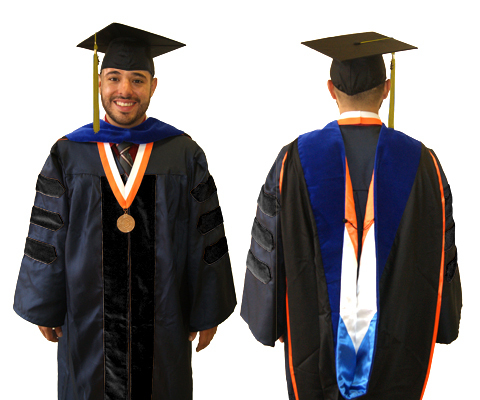 Doctoral degree candidates must submit the dissertation by this date to participate in commencement. Go to www.utep.edu/commencement for more information on commencement. Graduation applications accepted for summer conferral. Late graduation applications accepted for summer conferral. $15 late fee assessed. Names of summer candidates will appear in the fall commencement program. On-time graduation application deadline for degree conferral. Late graduation application for degree conferral. Last day to apply for graduation and have name included in the commencement program. Last day to submit doctoral bio-sketches for inclusion in the Doctoral Booklet. Deadline to defend the dissertation. Deadline to submit the dissertation defense form. Deadline to submit the Committee and Graduate School approved dissertation. Deadline to submit the dissertation signature page. Degree candidates must also submit the dissertation at the ProQuest/UMI website for on-line publication at http://dissertations.umi.com/utep. Deadline to apply for fall graduation. Deadline to submit the Committee and Graduate School approved dissertation. Deadline to submit the dissertation signature page. Deadline to apply for summer graduation. Two format checks are required: before the defense (preliminary format check) and after the defense (final format check). We strongly recommend that you submit the complete dissertation to your committee for review at least TWO weeks before your scheduled defense. If you have any questions, comments, or concerns that weren't addressed here, contact the Graduate School at (915) 747-5491 or gradschoolgraduation@utep.edu . Review the Goldmine on-line degree evaluation with your advisor to determine your graduation eligibility. The Goldmine on-line degree evaluation lists the courses you must successfully complete to meet degree requirements as determined by your Graduate Studies Committee and the Graduate Catalog. All coursework should be completed by the end of the final semester of study, demonstrating a 3.0 or higher cumulative GPA. N grades, P grades and I grades must be changed to a Standard grade or Pass/Fail grade and posted on the transcript by the conclusion of the final semester of study. Check with the instructor of record and ensure that a Standard grade or Pass/Fail grade is assigned to your last enrollment in dissertation hours. Graduate School policy requires students to be enrolled during the final term of study. Submit the graduation application by posted graduation deadlines. Ensure that all required information including scheduled defense date and committee membership is included in the application. The required fees (diploma fee and dissertation publication fee) will be assessed to your Goldmine account. Fees may be paid by accessing your Goldmine account on‐line through My.UTEP.edu , or in person at the Bursar's Office. The Graduate School sends email notification upon approval of the application. Please note that at this stage you are only a graduation candidate. Submit these additional required items to the Graduate School immediately after you receive notification that your graduation application is approved. Doctoral bio-sketch. Click here for a sample. The Survey of Earned Doctorates (PHD students only), a survey administered by the National Science Foundation and designed to form a national picture of graduating doctoral students. Verify your defense date which should be scheduled no later than two weeks before Dead Day of the intended term of graduation. Please refer to Doctoral Student graduation deadlines in the Deadlines Section. Summer candidates who participate in spring commencement must defend the final dissertation two weeks before Dead Day of the spring term. Summer candidates who participate in spring commencement must defend the dissertation by Dead Day of the spring semester, although the final dissertation is due at the end of the summer term. Summer candidates who do not select to participate in spring commencement may participate in fall commencement. Submit the dissertation to the Graduate School before the defense for preliminary format approval. All dissertations must be formatted the same way, and the most comprehensive guide for this may be found here. For your convenience, a Word template can also be found here. Please note that the signature page may not be accepted or approved by the Graduate School if the format is inconsistent or varies from established Graduate School formatting guidelines. Defend the dissertation and have committee members sign the dissertation defense/completion form. The defense form must be submitted to the Graduate School two weeks before Dead Day of the graduation semester. Refer to Doctoral student graduation deadlines in the Deadlines section for exact dates. Have your defense form completed and ready for signatures at your defense, so that you can submit it to the Graduate School immediately after the defense. Submit the dissertation for final format review after you defend and have made any final edits as recommended by your committee. After you receive final format approval from the Graduate School, you may proceed with the final submission of the dissertation. Submit the final copy of dissertation to Graduate School and ProQuest. Submit a hard copy of the signature page to the Graduate School by the deadline stated in Doctoral student graduation deadlines. The UMI website requires that you create a unique personal password for submission purposes. Traditional publication was billed to your Goldmine account when you applied for graduation, so there are no additional fees associated with uploading the dissertation. Any additional charges incurred at the UMI/ProQuest website are for services you have chosen to purchase so should be paid directly to UMI/ProQuest. After applying for graduation, you will receive an email generated by the Registration & Records Office with instructions on accessing the MarchingOrder website. Please register at the MarchingOrder website to RSVP your participation in commencement and pre-commencement. Direct any questions or concerns regarding the RSVP or MarchingOrder to the Registration & Records Office. Only the names of students who have applied for graduation in time to meet Printer’s Deadline will appear in the Commencement program. The Printer’s deadline is a very strict deadline, so exceptions for late submissions cannot be made. Check your student record for a “Confidential” indicator. A “Confidential” indicator prevents your name from being published in the Commencement program and in other graduation announcements. To release the “Confidential” indicator, please go to the Registration & Records Office. The name which appears in the program and on the diploma and transcript is your official name as it appears in your Goldmine record. Please refer to the Records & Registration Office for instructions on filing a name change. Please note that pre‐commencement is a college event, not a Graduate School event, so any questions, comments or concerns regarding pre‐commencement ceremonies need to be addressed with the office of your respective college dean. Former students who are granted permission to participate in commencement do not have access to MarchingOrder and cannot RSVP. Permission has to be granted by the Graduate School and the RSVP is manually entered by the Records Office. Degrees are awarded and posted on the final transcript approximately 30 days after the official degree conferral date. The diploma lists your awarded major and degree only. The final transcript lists the officially awarded degree, major and concentration if applicable. Diplomas are mailed to your Mailing Address as listed in Goldmine in approximately 90 days after the official degree conferral date. Make sure you update your Mailing Address in Goldmine to ensure accurate delivery of the diploma. Diplomas will not be mailed outside the United States unless alternative arrangements are made through the Records Office. Additional fees will apply for shipping outside the U.S.A. The diploma and transcript will not be released if you have an outstanding financial obligation to the University.